This Beautiful Toddler unit is filled with great activities for your toddlers. 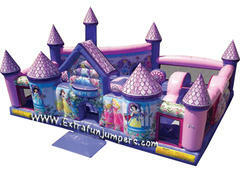 It has a small obstacle area, a 3 foot slide, a ball pit area (we do not provide balls) and a jumping area. There are educational games which will stimulate the minds for your tots. Name the princess, learn to count by matching the quantity of gems, various gem patterns that the toddlers will have to match (like a puzzle).